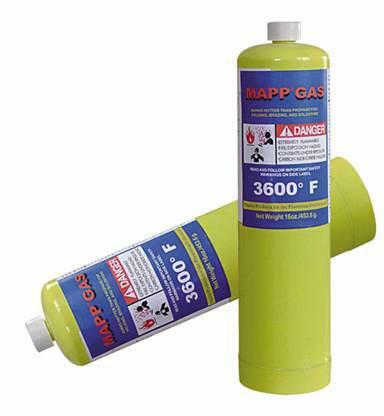 Mapp gas is a mixture of various hydrocarbons, principally, methylacetylene , propadiene and Propane(MAPP). 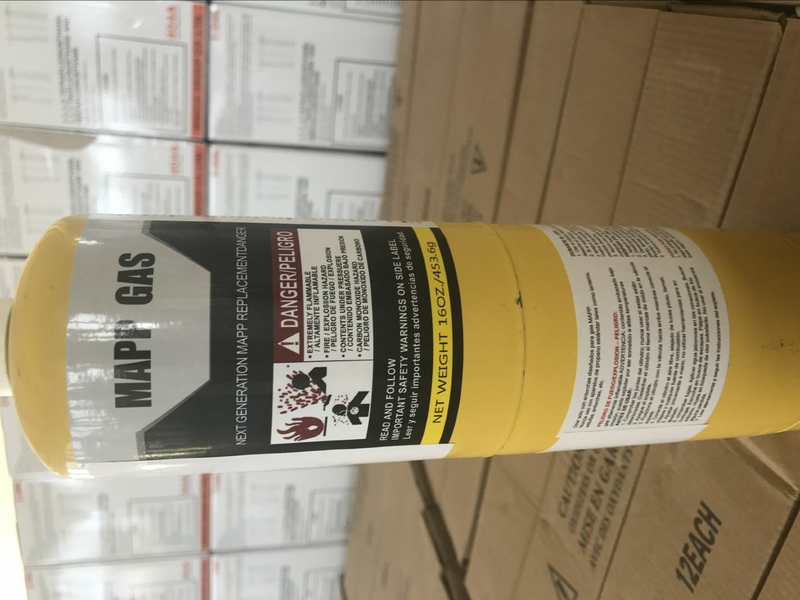 It produces a relatively hot flame (2,976°C) with a high heat release in the primary flame (inner cone) (15,445kJ/m 3 ), less than for acetylene (18,890kJm 3 ) but much higher than for propane (10,433kJm 3 ). The secondary flame (outer cone) also gives off a high heat release, similar to propane and natural gas. The combination of a lower flame temperature, more distributed heat source and larger gas flows compared with acetylene results in a substantially slower pierce time. 16oz/453.6gm per can, 12 cans per ctn, 17004 cans per 20ft container. 1. Its diameter is 75mm, height 280mm and gross weight 980g, convenient for holding and carrying.2. The welding temperature can reach 1350°C and the burning temperature can reach 1980°Cunder condition of anaerobic combustion-supporting.3. The burning time can be gotten 2 hours and 40 mins continuance under normal working circumstance.4. It guarantees you good jointing and shorter working time because of its scientific blend proportion and favorable flame characteristic. 1. Disposable steel cylinder (size: 75X280mm; NET: 16 OZ; 12 pcs /CTN, 17004 cyls per 20ft container). 2. Cylinder should be stored in cool, dry and ventilated place.